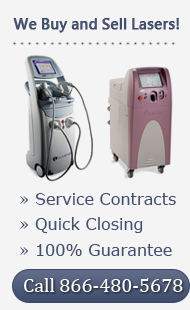 In addition to offering some of the lowest prices on refurbished cosmetic laser equipment, UsedCosmetic.com strives to provide unmatched customer service. If you have any questions or need more information about any of the cosmetic laser machines listed on our site, simply fill out the form below and we’ll respond quickly. You can also request a price quote on any cosmetic laser machine we offer. If you are looking for a model that is not listed on our site, just let us know and we’ll do our best to find the right model for your needs and budget.